1. Streamline and simplify wherever possible to maximize client’s FPS. 2. Incentivize teamplay, but don’t penalize lone wolves. 3. Build in quality of life systems which allow the mission to police itself rather than requiring extensive intervention by server moderators. 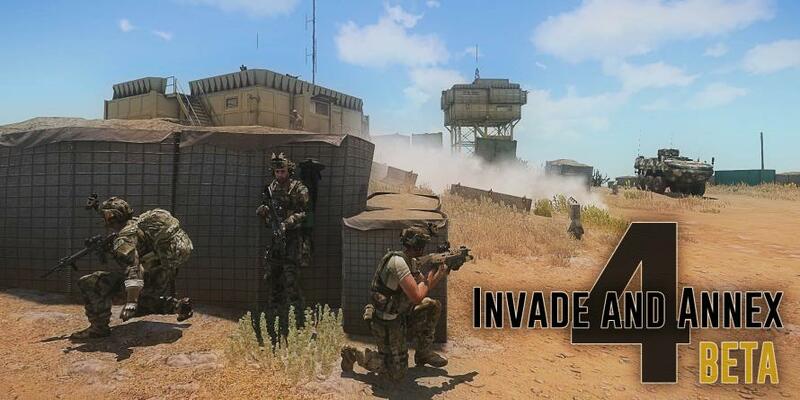 For those of you who haven’t played Invade and Annex before, the premise is simple: your area of operations is under attack by enemy forces, and your platoon must work together to push them back and re-capture the island. The main objective represents a simple task where the task is simply to destroy all the enemy forces present. Typically, the main objective is defended by roving enemy patrols and vehicles, but may also contain an enemy command and control center. Destroying a large majority of enemy forces will complete the objective, and a new objective will spawn. Any enemy forces remaining in the completed objective will move to defend the new objective. Any players present in the main objective area when the mission is completed will be given reward points (the longer you’re present in the area, the greater percentage of the reward you receive). Secondary objectives will also be created during the course of the mission. These are special objectives with harder victory conditions, but also offer more reward points for their completion. The objectives may also connect to each other: enemy artillery may need to be destroyed, and as long as it is present it will rain shells down onto forces that may be attacking the main objective. Secondary objectives are only available for a certain time, after which they will fail automatically. 1. Dynamic groups: change roles within the game; you don’t have to go back to the lobby to switch roles. 2. 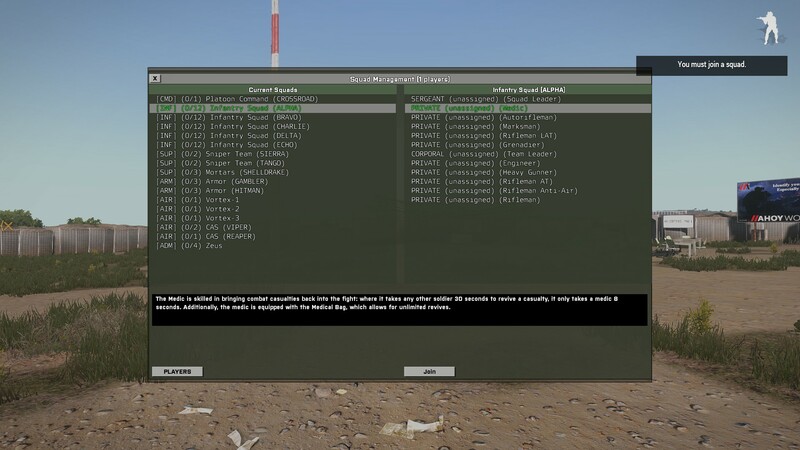 Playable and enemy faction options: play as NATO, CSAT or AAF. 3. Reward vehicles have been replaced by purchasable rewards. As the player progresses through the mission, they accumulate points which can be spent on reward vehicles, gear and miscellaneous features. 4. 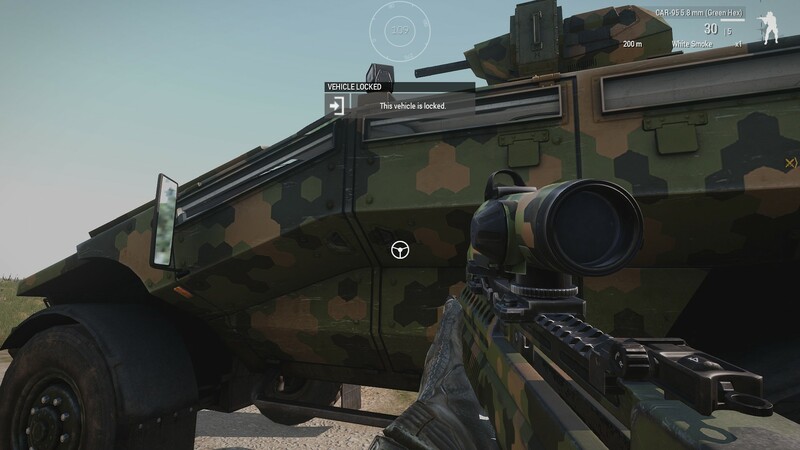 Vehicles and backpacks can now be locked by the player. 5. UAV role is now completely autonomous, players can spend reward points to issue recon and strike missions. 6. New spotting mechanic allows players to spot targets, which are visible to other team mates both in the world and on the map. 7. Civilians and civilian vehicles are now present on the map in built-up areas to make it less obvious who is or is not a target; killing a civilian will result in a reward point penalty. 8. Improved enemy intelligence and support options: enemies can call in air support against troublesome players, and will no longer just sit there and take it from player attacking them at long distances. 9. Medical system: now using BIS vanilla revive system, instead of Derp medical, any player can revive another, but medics do it faster.